I’m back and despite thinking I’d have some sweet Commander 2017 leaks to discuss, I am sort of without anything to talk about and thought it was the perfect time to pick up the “Things I learned sorting by color” subseries that I’ve done exactly one other installment of. I actually managed to get some insight into what EDH players want and need when it comes to the color green merely by looking at the top cards from that color. I think there is stuff to be learned from looking at the other colors, also, so I’m going to… you know, do that. Here’s a refresher of what I did so you can do it yourself. Click the “cards” button on any page to open the dropdown menu. Navigate to “color” to pick a color and then see the top cards in that color. It’s easy, but I still felt like showing you what I did so we’re on the same page, literally and figuratively. Are we good? OK, then. Let’s dive into Red because I’m sure we can learn a few things, hopefully things that we can use to predict which cards from new sets will catch on so we can buy those Magi of the Wheel when they’re $2 because that’s what we’re all about. The top 3 most played red cards are removal, that sticks out a little bit. Removal, especially good removal, is at a premium in any color but in red, it seems like players are shoehorned a little bit more. Despite being pretty bad as a color, Mono-Red is fun to play and popular and that’s not going to change. When you elect to play Mono-Red, you accept certain realities and one of those realities is that you’re going to have a hell of a time dealing with Enchantments. Chaos Warp has become a red staple in part because it does something that red basically can’t do otherwise (and it used to be able to tuck a commander so a portion of its play is an artifact of that. It’s good enough not to take out of the deck even though its role is diminished and then a reprinting helped keep it accessible so more people can add it to new decks. That was a long aside. Any longer and I’m going to start putting numbered links to endnotes like I’m David Foster Wallace over here. Let’s get back to the previous sentence, already in progress) and that’s removing problem permanents like enchantments. One of the Top 3 cards helps red shore up something it does badly, but the other 2 are cards that help red do what it does well – dish out a ton of punishment and destroy artifacts. Both mechanics – Blasphemous Act’s precursor to “Undaunted” and Overload, are very good mechanics and similar mechanics on future cards will get a long look, especially if they do the things these cards do, but maybe better. I mean, you don’t need an article to tell you a Blasphemous Act that does 15 damage for 9R is better, I’m just saying. People knew Blasphemous Act wasn’t a 9 drop but they still acted like Curtain’s Call was too expensive. That card was like $0.50 for a minute, so I appreciate a lack of imagination from the community sometimes since that was a nice quintuple up for me. 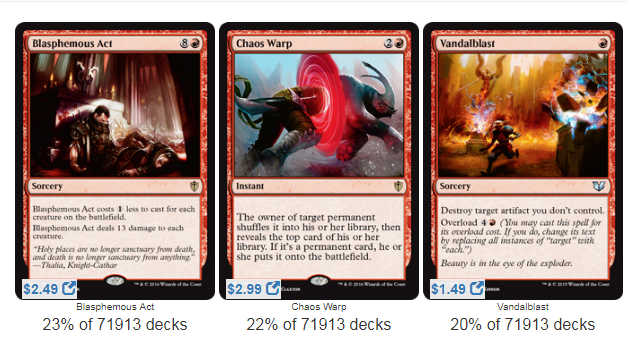 Red even plays removal like Lightning Bolt which I think scales horribly in EDH but which is still in 6% of all 72,000 decks with access to red mana. Red does removal and red does it well, so when I saw a card like “By Force” I was pretty sure it was going to see play. It’s getting there slowly, seeing play in 256 decks so far. It’s no Vandalblast but it may make you more friends if you can leave some people alone. Expect any future red card that can deal with Enchantments to get a real long look from EDH players and potentially become a staple, quintuply so if it’s Legacy-playable. 2. Can I Borrow That A Second? It’s taking a minute, but I think Mob Rule, barring a reprinting, has legs. It has a few knocks against it. It’s not Insurrection for example, it’s a recent non-mythic, it can’t always go wide enough to get around big creatures or go big enough to get past an army of chump blockers (giving all of your creatures trample helps, but that’s a 2-card combo to build a bad Insurrection) and even so, Mob Rule is in 2% of the 72,000 eligible decks – that as much usage as Jokulhaups, Fiery Confluence, Warp World and Bonfire of the Damned. At sub-$1 foils like this seem pretty good and they’re not as easy to reprint, which is double plus good for this card. It’s not just big, massive swipin’ spells that red loves, though. Zealous Conscripts is a big card and it’s bigger because it combos infinitely with Kiki-Jiki. Molten Primordial gets a ton of play, also, so the combo potential is potentially an afterthought (I still see Maelstrom Wanderer decks run Pestermite, a basically useless card, when they could run Zealous Conscripts to Tooth and Nail for like I do) in the grand scheme of things. Conscripts is stupid and it’s better with cards like Deadeye Navigator or sac outlets so you never give the creatures back. 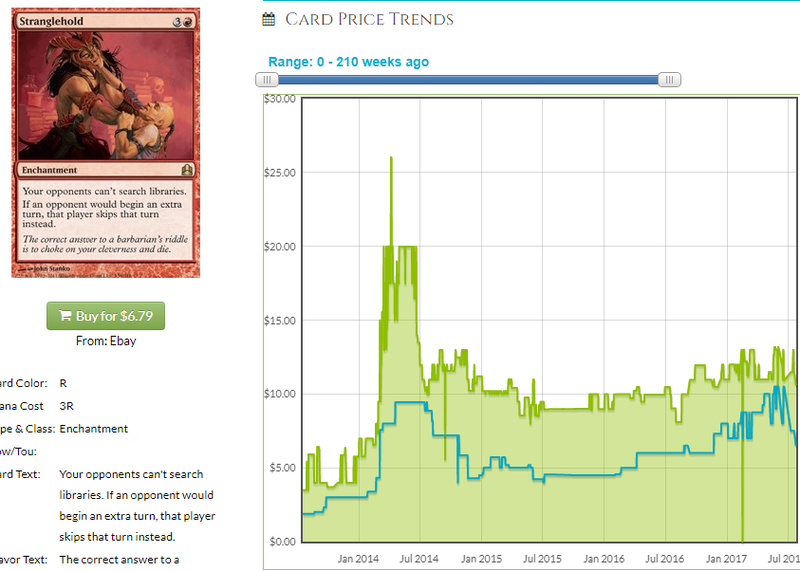 Threaten effects are over-represented in the Top 100 and I think that’s telling. When they’re printed, they tend to look like Limited chaff sometimes, but Threaten effects really get there. 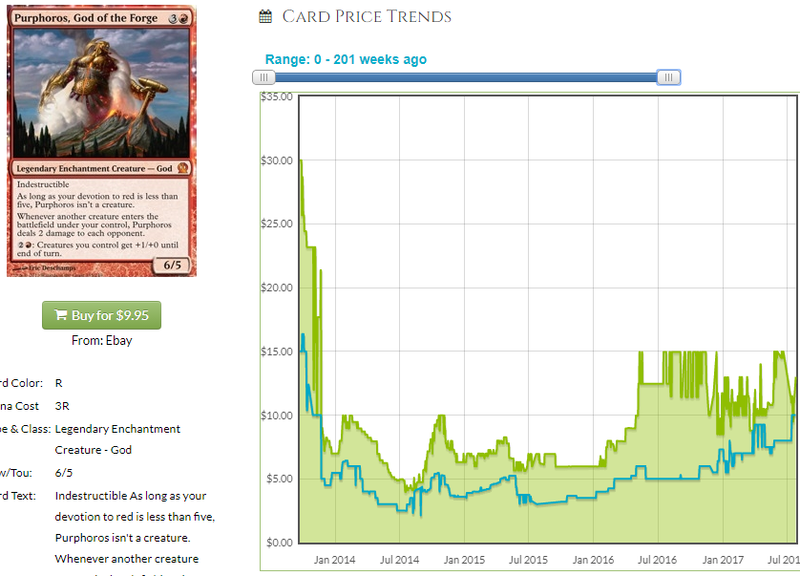 Pay special attention to those printed at rare because those have financial upside, especially in reprint-dodging foil. Rare Threaten effects are worth looking at, especially if they print new, very good ones. I don’t know how relevant financially this is but I do know that a significant portion of the Top 100 cards fit this bill and I’m not discriminating between things worth knowing and things worth knowing that may not make us money in the immediate future, here. It may be all Narset’s fault, but extra attack phase cards are creeping up a lot. Taking extra attack phases is a great way to squeeze in a ton of extra damage and if you have cards to double damage or give creatures double strike, you’ve got a double double situation and that makes me want to get In ‘n’ Out burger but they don’t have those around here and the last time I went to In ‘n’ Out burger, it was in Vegas and the food was super terrible so I don’t even know, some people who have access to both In ‘n’ Out and 5 Guys says 5 Guys is better so I don’t know what to think. I talked a lot about how Mana Echoes is a “print or die” card that could get a ton of attention after people start building tribal decks and barring a reprint in Commander 2017 it could become $30 and basically unreprintable? Well, imagine all of that stuff but applied to this bad boy. They have a lot of choices for Relentless Assault effects to reprint if they’re inclined to do one in, what, Commander 2018? The reprint risk is mitigated by the plethora of equivalent, more reprintable targets leaving us with a $14 card that has no reason to come down, really. 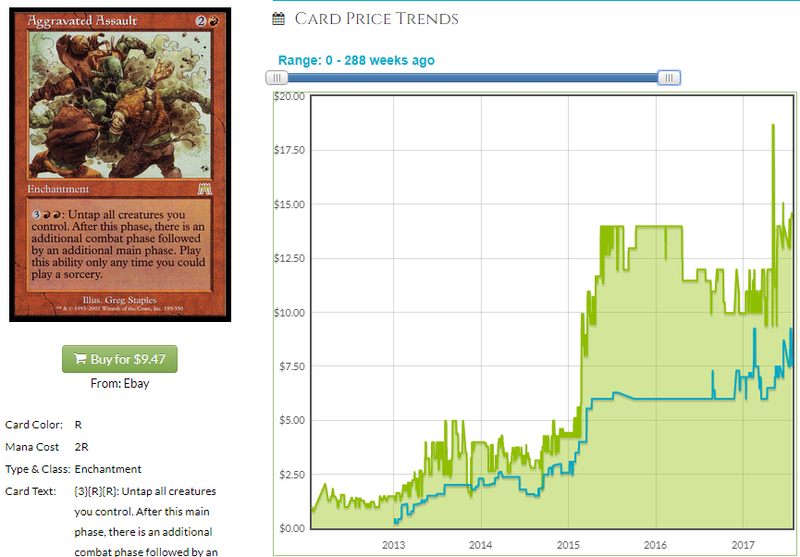 This ticks up slower but I think has the same “reprint or die” tipping point that some of the other cards I’ve highlighted have had. Just watch what happens with Patriarch’s Bidding. If it pulls a Phyrexian Altar, take a look at Aggravated Assault. They print another “triggers on swinging” card like Narset and this is $30, bank on it. Cards like Warp World, Gamble, Grip of Chaos etc. don’t seem terribly good, but that’s OK by Red players. Red isn’t terribly good and they’re not in it for the guaranteed win, they’re in it to mess things up. I play Warp World in my Prossh deck because I firmly believe in screwing with the game and, besides, if you don’t have a Food Chain out when you cast Warp World with 30 kobolds, your odds just went way up. I have had 50 Kobolds out and Warped right into Food Chain, Prossh and Goblin Bombardment. It’s hard to lose the game when you do that. It went from “Hahahaha guise wut if i casted warp wurld rn wuldnt that be lulz” to “I ween!” in under a minute. That’s the secret charm to these cards – you look like you don’t have a plan until it comes together. It’s the drunken boxing of EDH. Add to that the number of times a spell about to blow up one of your permanents gets something else instead or you force two people to hit each other who were leaving each other alone and you can break the game wide open. If you attack one person three times in a row, they’ll resent it, but if you randomly roll a die and get them three times in a row, they’re mad at the die. That’s politics, baby. As much fun as those cards are and as many decks as they appear in (and in as many decks as they appear? And with as many decks in which they appear? How do I not end that with a preposition?) there isn’t a whole lot of financial upside to them since they’re pretty reprintable and they need to be like Gamble, old enough to drive, to drive their own price up. As much as chaos effects are cool, they might be bulk rares. That is, unless, you stop them from doing something at the same time. Also the name of a decent song by a terrible musician and worse person, Stranglehold is the kind of card that might need a reprint and might not get it. A Commander original, the reprint venues for a card like this are pretty few. Cheating a bunch of stuff into play with Warp World is one way to cheat, but being the only one whose cheaty stuff works is another. If you’re untapping all of your creatures with Relentless Assault anyway, why not play Smoke to lock them down? If you can’t take extra turns because why would you play Final Fortune (503 decks do, by the way, a lot of them Krenko because Krenko is a YOLO deck that plays Warp World and kills people with Purphoros. Wait, why don’t I like Mono-Red? ), you can always put them in a Stranglehold. Then you can say “You best get out of the way” but they can’t get out of the way, you’ve got them in a Stranglehold, they’re basically stuck like right in front of you. Let their neck go, Ted. Idiot. Prices aren’t going up a ton, but supply is dwindling. This is a card that people can take or leave but scarcity, modest demand, time elapsed since OG Commander and new decks being built by people who aren’t taking apart their old decks all conspire to push this price toward a tipping point. 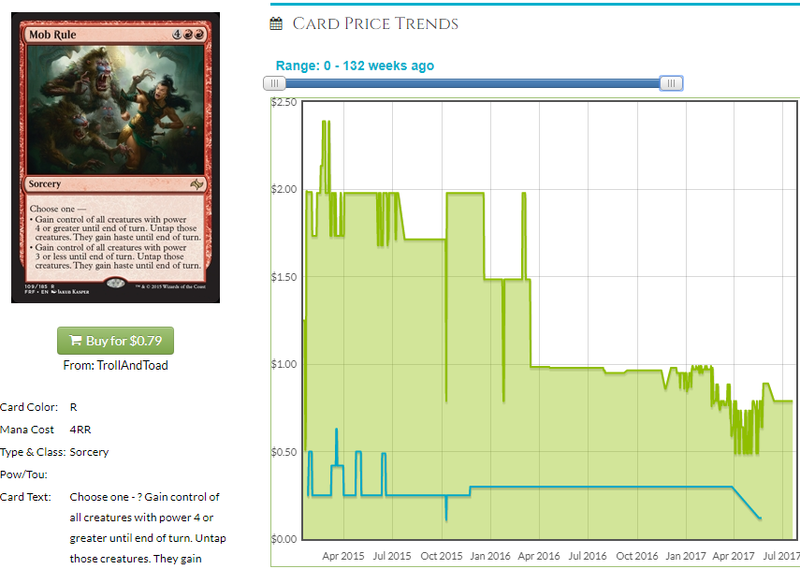 They don’t want to reprint a $13 Stranglehold but they basically can’t reprint a $22 Stranglehold. I’m finding some pretty juicy “Reprint or Die” cards I didn’t expect to find in Red. This card is reprintable. I mean, maybe. They reprinted Iroas, but that was in a boring deck and they haven’t really shown any indication of reprinting Gods recently. I think a lot of people are worried about this getting reprinted. I know I am – I have a lot of copies I am sitting on, although I sold enough when it first crested to have broken even so they’re all free copies, which I appreciate. Could we get hosed on a reprint, here? 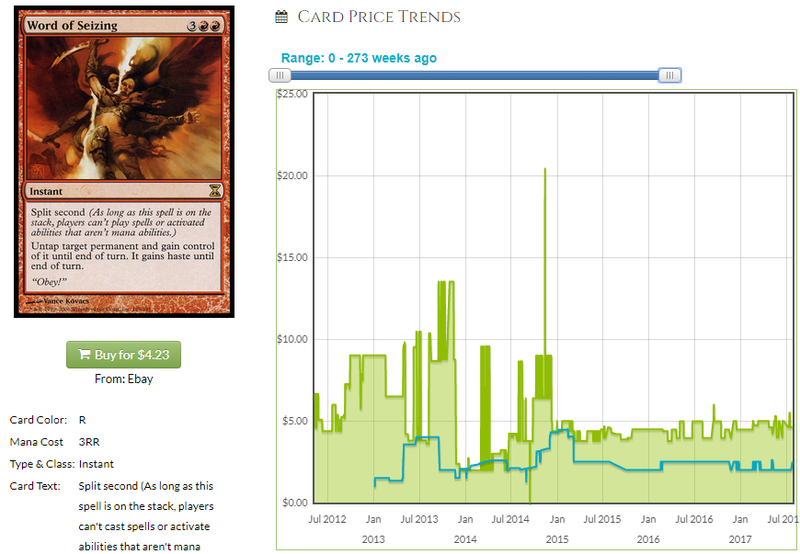 Yes, but this card is also so stupid that it could easily be $25 in a year or two, especially since it’s the 4th-most played card in decks with access to Red. Winning with this and a flood of tokens feels good. That does it for me this week. I think there is some actionable stuff here and I think we should keep an eye out for cards that resemble cards in Red’s Top 100. Any upgrade on an existing card has a ton of applicability and demonstrated demand, and sometimes EDH can make stuff happen, especially on foils and mythics and older cards. Until next week! 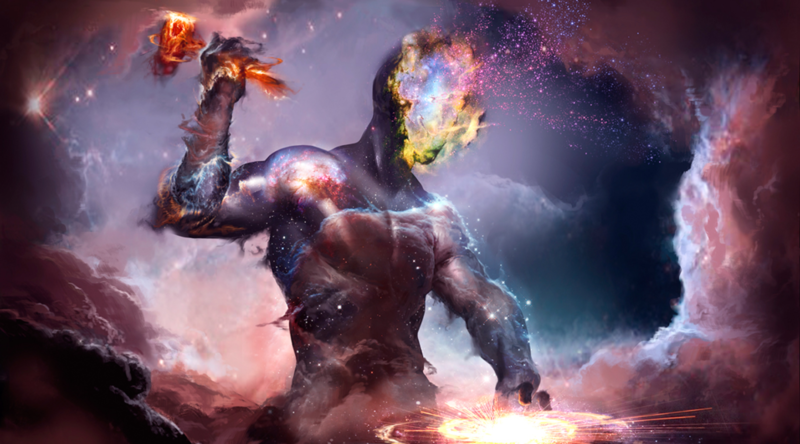 What card is the header image from? Oh well, at least it’s not an unplayable card with awesome. I’ll use this opportunity to say I’m a huge fan of your writing. Your articles on 75% are the most important influence on my deckbuilding.